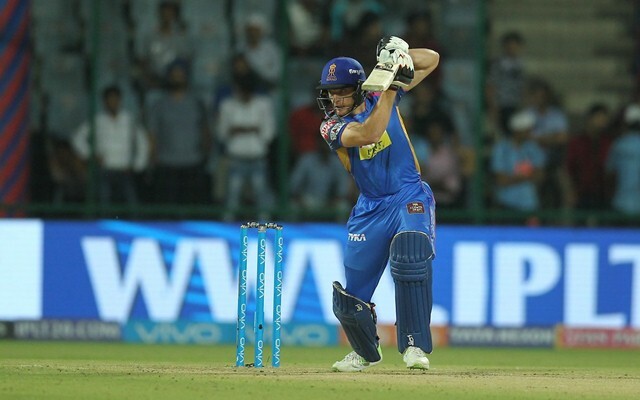 Jos Buttler played a stupendous hand of 67 runs off 26 balls against the Delhi Daredevils. Jos Buttler has a reputation of hitting the long ball and has the ability to decimate the best of bowling attacks. The Somerset-born cricketer is currently representing the Rajasthan Royals (RR) in the eleventh edition of the Indian Premier League (IPL). During yesterday’s game between the Royals and the Delhi Daredevils (DD) at the Feroz Shah Kotla, he gave a glimpse of his stupendous self. The match was curtailed quite a bit by rain and the visiting team was set a daunting target of 151 runs to win in 12 overs. However, the target didn’t perturb him and he blazed away to an 18-ball fifty which put the skids under the home team. The cricketer believes that a player can grind himself as per the demands of a specific format, bearing in mind the rigours of playing all three formats. “I think there is nothing wrong in people wanting to specialise in the sport. It is becoming increasingly tough to play in all three formats. I don’t think we should have that snobbery that if you play cricket, you need to play all formats.” Buttler said after the match. Cricket isn’t a sport which can be played for a long period, unlike any other profession. Hence its necessary to make a fortune before one hangs his/her boots from the game in order to ensure financial security going ahead. Buttler, during his chat, also iterated the significance of earning. “The climate of cricket has changed a lot with the IPL and the money the tournament offers. At the end of the day, we are professional athletes and we have a short career. To a big extent, earning as much money in that time is hugely important,” the wicketkeeper-batsman added.